Beach camping was something new to us. Our family backpacks together and has camped often, but camping on a beach is very different. Between our 2 families we had 3 sleeping tents, 3 shade tents, and one tent for the porta potti. Spread out around the top of the cove, we named it Tent City. The morning air was perfect, I went down to the water for a short swim and then worked on breakfast. Slowly the kids emerged from their beds. The two older boys slept on Unsinkable 2, and the rest slept in the tent. With a few non-swimming younger kids among us, we decided to rig a line stern to stern on the boats, so if the kids drifted out that far in their life jackets they could simply pull themselves over to shore. 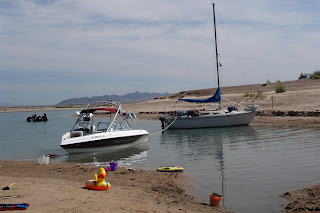 Anchoring a boat on shore at Lake Mead was quite a challenge. Although the water was 2-5 feet deep in the top of the cove, if I wanted to drop an anchor I would have to go out a little ways to allow for anchor swing, and the water quickly dropped to 50 or 75 feet deep! The water level dropped about 6 inches per day while we were there. This has been a good water year for the mountains, however Lake Powell is upstream from Lake Mead, and apparently Lake Powell managers are letting it fill first before they share excess water with Lake Mead. 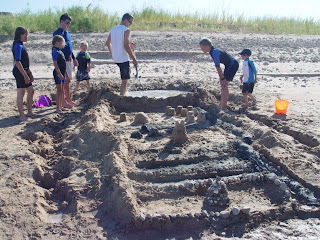 The dropping water level did not cause much problem, the kids just moved their sand castles further out each morning, and we had to lengthen our shore anchor lines each night when we called it quits. The kids built an enormous sand castle - actually a sand city. They named the town "Jacobugath" after the ancient city in the Americas that was destroyed by flooding. The kids included a large reservoir at the top of the hill above the city, which they breached for the fun of watching the city flood. The city contained numerous walls and towers, all lined with seashells and fortified with the best mud they could manufacture.